A document that can be printed and handed out at an event. 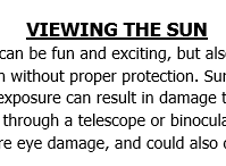 This event handout gives tips and materials needed for viewing the sun safely from home. This is a fun craft for children at a solar viewing event. Print out copies of the fan, double-sided. Have them color and decorate as they please. Then fold them up accordian-style along the lines. Finally, gather the folds at one end, and fold over about an inch and tape, clip, or staple to hold it in place.